Tue, Aug 7, 2018, 10:32 am SL Time, ColomboPage News Desk, Sri Lanka. 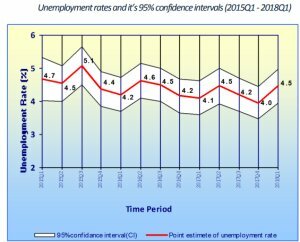 Aug 07, Colombo: Sri Lanka's unemployment rate for the first quarter 2018 rose to 4.5 percent compared to 4.1 percent reported for the same quarter in 2017. According to the Labor Force Survey data released by the Department of Census and Statistics, the unemployment among females in all age groups and youth is higher than that of men contributing more to the overall unemployment of the country. The overall unemployment rate reported for female is 7.4 percent while it is 2.9 percent for male. Female unemployment rates are higher than those of males in all levels of education. Youth unemployment rate (age 15 - 24 years) corresponding to the first quarter 2018 is 21.8 percent and that is the highest reported unemployment rate among all age groups. 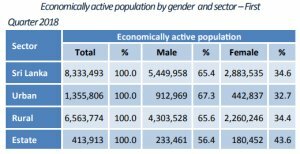 Among the 8.3 million economically active population in Sri Lanka in 2018 first quarter, 65.4 percent were males and females account for 34.6 percent, the Census and Statistics Department data shows. Out of the economically inactive population of 7.7 million, 25.6 percent are males and 74.4 percent are females. Higher female participation is observed in the estate sector with 43.6 percent of women working while the women employment in the urban sector was the lowest at 32.7 percent. Out of the total of 7,961,358 employed population in 2018 Q1, female employment declined to 2,669,210 from the 2,995,161 women employed in 2017 Q1. Of the 7.96 million employed, 45.2 percent engaged in Services sector, 27.9 percent in Industry sector and 26.9 percent in Agriculture sector. In 2018 Q1 a decline in employment numbers can be observed in all three sectors compared to the same quarter last year. In 1st quarter 2018 the estimated labor force & employed populations have declined and unemployed & inactive populations have increased compared to the estimates in 1st quarter 2017. However, when sampling errors and interval estimates are considered these changes are not statistically significant. Ground level information show that one of the reasons for these changes may be the prevailed drought conditions and other environmental factors that affected the employment. Also considerable changes in Inactive population is observed among youth (age15-24) & among elders (age 60+). Also the increase of inactivity is higher among women engaged in household activities, persons engaged in studies, physically disabled and retired/old age persons. (The Department of Census and Statistics cautions that sampling errors and confidence limits need to be considered when interpreting changes in unemployment rate).